Spark brought the Jimi Hendrix Estate and Von Dutch Watches together in a deal agreed at the JCK Las Vegas, the US’ biggest jewellery trade fair. As diamonds and jewels brought even more sparkle to “Sin City” than usual, Von Dutch Watches announced the imminent launch of a new line of watches inspired by music legend Jimi Hendrix. Spark Marketing Entertainment brought the two partners together and oversaw the day-to-day project management. A luxury priced limited edition watch aimed at a collectors market featured Jimi Hendrix’ signature. A mass market watch was also launched on a worldwide basis. For Anto G., Von Dutch Watches CEO, the deal was a dream come true: “Jimi Hendrix is one of my favourite artists of all time. For us, having the opportunity to design a watch inspired by such an icon as Jimi and develop creative ideas around it, is very fulfilling. 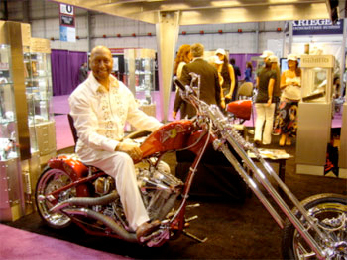 We have already received a great reaction from key buyers and foresee a huge sales potential for the watch range.”Celebrities visiting the Von Dutch Watches booth included Toni Braxton and Adrienne Curry, winner of “America’s Next Top Model” (Season One) and ambassadress for Von Dutch watches. Toni Braxton congratulated Bob on the deal.